In recognition of its continuous efforts towards the development of the commodity futures market, and offering an effective hedging platform to the commodity stakeholders including base metals and bullion participants, Multi Commodity Exchange of India Ltd (MCX), India’s No. 1 commodity exchange has been awarded ‘Best Exchange - Bullion & Metals’ by Commodity Participants Association of India (CPAI) at their 5th International Convention themed “Changing Dynamics of Commodity Markets’ held at New Delhi on Saturday, March 18, 2017. The event brought together experts from across the derivatives industry—a diverse mix of the regulator, exchanges, brokers, corporates, commodity researchers and academia to discuss key themes and trends that are shaping the commodity sector. Shri Radha Mohan Singh, Hon’ble Union Agriculture Minister; Mr. Santosh Gangwar, Hon’ble MOS for Finance; Mr. Ajay Tyagi, Chairman, SEBI, were present among other dignitaries at the event. 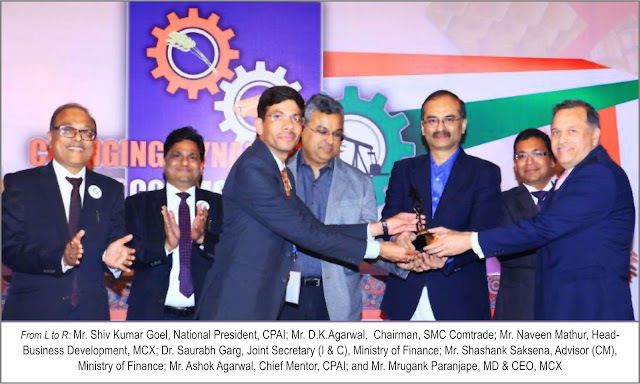 The award was presented to Mr. Mrugank M Paranjape, MD & CEO, MCX by Dr. Saurabh Garg, Joint Secretary (I & C), Ministry of Finance; and Mr. Shashank Saksena, Advisor (CM), Ministry of Finance. MCX continues to traverse the growth path. During 2016–17 (Apr-Feb), the average daily turnover in 2016–17 stood at Rs 22,892 crore, up 5% year-on-year (y-o-y). The major contributors to this growth were base metals and bullion; base metals pitched in with Rs. 6,713 crore (up 13.8% y-o-y), and bullion added Rs. 8,133 crore (up 3.1% y-o-y). “The Exchange’s leading position is underpinned by strong fundamentals that enable it to capitalise on the emerging opportunities. Going forward, as the largest commodity exchange in India, we endeavor to raise the bar and introduce new products in the near future, to meet the needs of our diverse market participant base”, he stated. “Further, in order to achieve the cherished vision of ‘Make in India’, we all need to work together to invigorate India’s commodity derivatives market, helping realize the vision with which it was created”, Mr. Goel added. Having commenced operations on November 10, 2003, Multi Commodity Exchange of India Limited (MCX) is India’s first listed, national-level, electronic, commodity futures exchange with permanent recognition from the Government of India. The current market share of MCX stands at 90%. MCX offers the benefits of fair price discovery and price risk management to the Indian commodity market ecosystem. Various commodities across segments are traded on MCX. These include bullion, energy, metals and agri commodities. The exchange has forged strategic alliances with various international exchanges, as well as Indian and international trade associations. For more information about MCX and its products visit www.mcxindia.com.